So much for my quest. First day went OK, but not great, with me winning a seat to a $50+$4 satellite on PokerRoom, which it turns out is good for any $50+$4 event apart from the one I wanted to play in. Looks like entry to the Stage 2 Poker Classic is via the Stage 1 tournament only. Bit stupid really, and a pisser for me because now I have to find a decent $50+$4 to play on there. In any case, through some combniation of not having a clock in the living room and getting caught up in the previous night’s Big Brother on Sky+ over tea, I’d managed to miss the 7pm Stage 2 tournament three nights running. Played just one more UltimateBet satellite since my enthusiastic qualification mission began, and subsequently turned into a damp squib. Just too much to do before Vegas (T-14 now!) so it was totally the wrong time to try something like this. 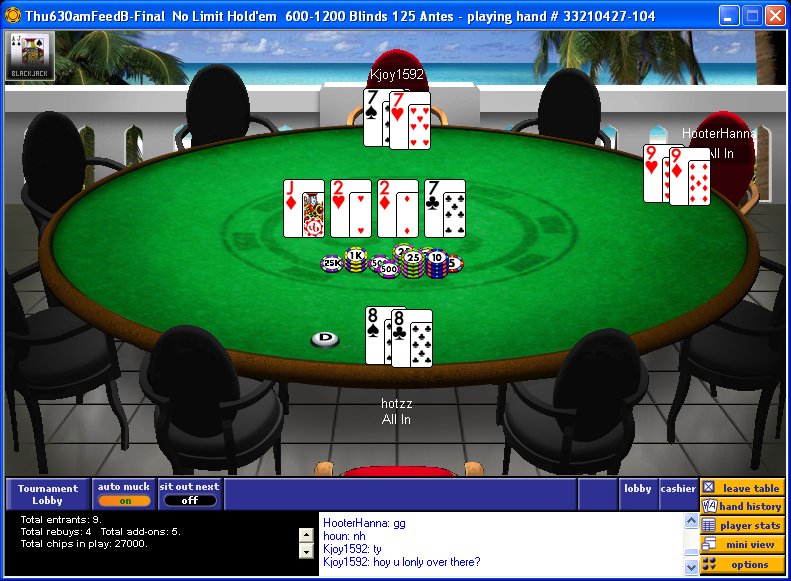 Three handed and short-stacked, I move all-in for about 7 times the big blind with a pocket pair. It’s usually ahead here. The small blind calls with his pocket pair. He figures to usually be ahead. Big blind goes mental with the third pair and we’re in a three-way all-in situation 77 vs 88 vs 99. Needless to say the winning hand was belonged to the chip leader so it didn’t matter that he was way behind pre-flop. It was all over 3 seconds later. I made some notes along the way in this satellite also – see, I started off on the right foot with the quest! But right now I think leave it at that. To be continued… sometime, hopefully fairly soon. Maybe.